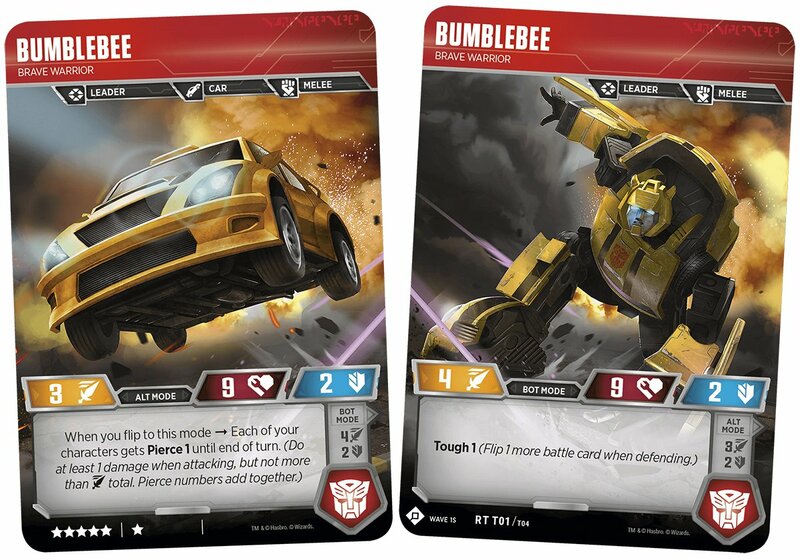 Transformers Trading Card Game looks perfect for kids, but is it more than meets the eye? The upcoming Transformers movie, Bumblebee, is on the way to theaters with a lighter approach than the previous films. Trailers paint the prequel as a lighthearted tale of friendship, with the titular Transformers finally looking more like the toys first launched in the 1980s. The Transformers Trading Card Game captures some of that nostalgia, with double-sized character cards, art from the comics, and a nifty mechanic that lets players turn Optimus Prime, Bumblebee, Megatron, and Starscream from vehicle to robot and back (as the original toy packaging proudly proclaimed). 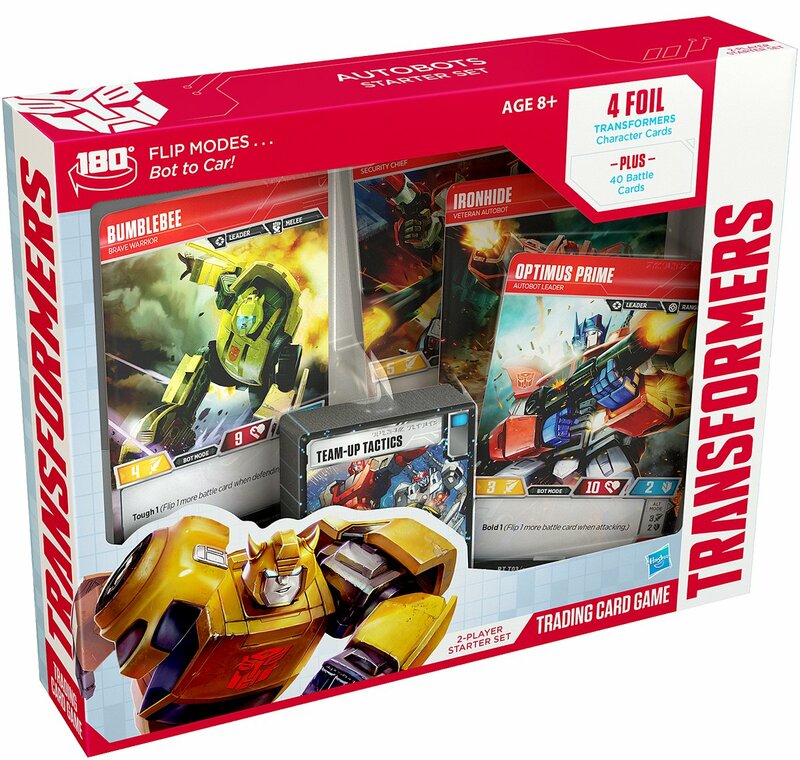 The best way to start your Transformers TCG collection is with the Autobot starter set (MSRP $14.99). This comes with four double-sized character cards (Optimus Prime, Bumblebee, Red Alert, and Ironhide), 40 battle cards, cardboard damage tokens, and a turn order card. Like most card game starter sets, this is enough to get a feel for how the game plays, but doesn’t give you enough to build decks or play a game with the full ruleset. If you or your kids have played Pokemon Trading Card Game, you’re already familiar with the concept of booster packs. For Transformers TCG, blind booster packs (MSRP $3.99) come with one double-sized character card and seven battle cards. 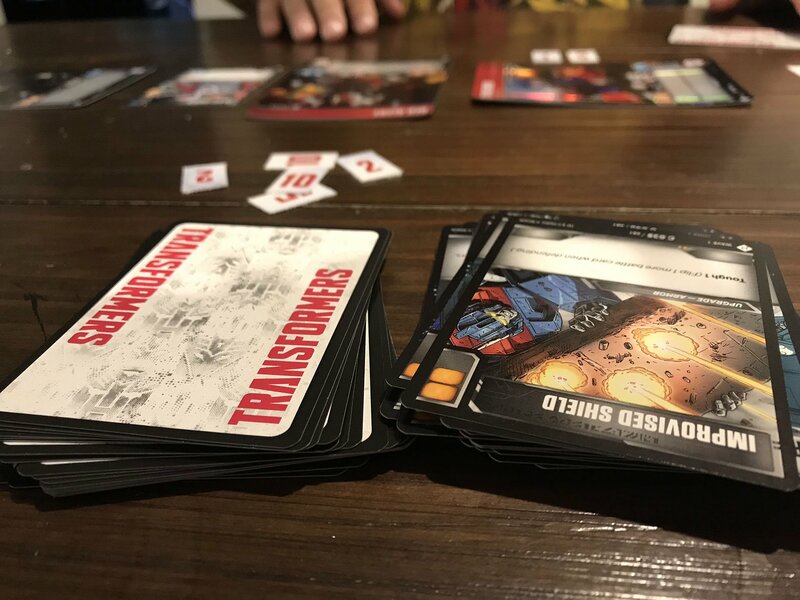 Transformers TCG is a two-player game (though house rules can easily be implemented for team play or free-for-all multiplayer). The game can be played in three ways, depending on player age and collection size. The most basic version uses only the attack, defense, and health numbers on each character and colored boxes on battle cards that bolster one of the two stats during combat. Rules text is entirely ignored here, which makes the game more accessible for pre- and early readers. The battle cards aren’t just used to enhance attacks and defense. In the advanced starter game, each player will have a small hand of them to play as one-time actions and permanent equipment attached to characters. Some of the character cards also have abilities like drawing more cards for your hand or flipping additional cards in battle to do more damage or sure up defense. Out of the starter box, each player has two characters of their own and share the battle card deck. Once players have large enough collections, they can start building their own decks. Each character has a star rating indicating its power. There’s no limit to the number of characters you can field, but their star total must be under 25. A battle deck of 40 cards is recommended. It’s easy enough to house-rule a play mode that allows players to draft (take turns choosing) characters from a shared family collection and randomly select a shared pool of battle cards. This would be a great alternative for readers that understand how the cards work, but don’t yet have the tactical prowess to build a strategically sound battle deck. Turns move quickly (an entire game lasts about 30 minutes). On your turn, you can transform one of your characters from robot to alt-mode or vice versa, play one action, equip one upgrade, and then attack. Once a character takes damage equal to its health or greater, it’s KO’d and removed from the game. The last player standing wins. Is it cheap cardboard or quality components? As a lifelong Transformers fan, I’m delighted by the large foil character cards. The six we’ve seen so far in person (and the dozens that have been revealed online) all look wonderful, featuring well-known characters from the cartoons and movies. Expect that future sets will include new versions of already released characters with different stats and abilities, as well as new art. There are two pieces of the package that let down the experience. The damage counters are flimsy, thicker paper. You can use anything else you have on hand if they get damaged or lost (dice, buttons, or pennies for example). The biggest mistake made is that the starter set doesn’t come with a full rule sheet. Wizards of the Coast and Hasbro expect that players and parents will watch videos on the official website and print three pages of rules. Even then, the rules are missing something important: keyword definitions. Cards with keywords do include short text to explain what they mean, like “bold” that allows you to flip another battle card when attacking. A full glossary with a bit more exposition would be useful not only for clarity, but to give players a broader idea of card interactions and inspire ideas for deck building. 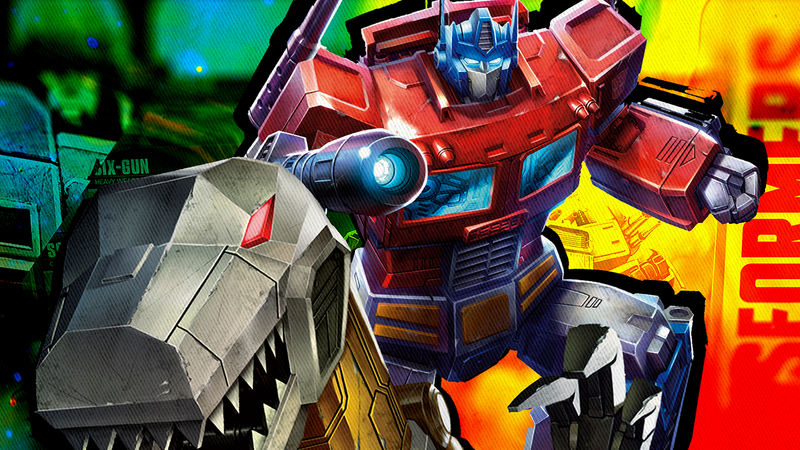 At $14.99, the starter box is a no-brainer for families that love Transformers or Pokemon TCG. The absence of a full rulebook in the box is a head-scratcher, because the small turn-order card really doesn’t cut it. With a couple of turns under your belt, things move quickly and smoothly. Even without deckbuilding, there are interesting strategic decisions to make on most turns. There’s slightly more luck involved than Pokemon TCG and Magic: The Gathering, so consider your own tolerance when making a purchase decision. What surprised me the most is that with the starter characters and the two from our booster packs (Hound and Bombshell), things were well balanced. There’s quite a bit of luck involved, as the draws from the battle deck to augment damage and defense can mean the difference between a character being knocked out or barely hanging on to life. Transformers TCG is off to a strong beginning with the starter pack. It does enough differently that it warrants a look from card game players, and it makes great use of the Transformers brand. Review product was provided by Hasbro.